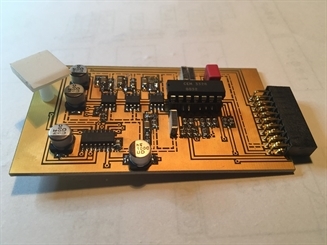 Based on the CEM3328 filter chip. 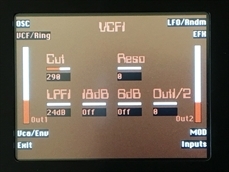 4 different lowpass slopes can be selected and mixed to create other filter modes. Please see the Anamono X / Xmini user manuals on details how to install this. After installation, you must set it up in the menu's, in order to make it work properly. On Anamono X go to "More..>Common>Filter Settings", and set either filter 1 or 2 to: 5-MiniProphet, depending on in which filter slot you installed it. On Xmini go to "Edit>More...>VCF Type", and set the filter to: 5-MiniProphet. 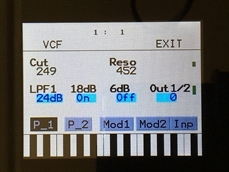 LPF1: Switches filter output 1 between 24dB and 12dB steepness. 18dB: Switches the 18dB lowpass block on filter output 2 on or off. The phase of this is inverted compared to the phase of the 12 and 24 dB outputs on output 1, so when mixing with these, different filter modes can be obtained. 6dB: Switches the 6dB lowpass block on filter output 2 on or off. 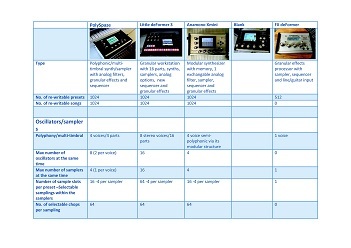 The phase of this is inverted compared to the phase of the 12 and 24 dB outputs on output 1, so when mixing with these, different filter modes can be obtained. Out1/2: Mixes between the filter outputs 1 (12dB/24dB) and 2 (Inversed 6dB/18dB).